In 2015, Forrester predicted that one million of the 4.5 million B2B sales professionals in existence will be out of a job by 2020. The firm explained there are currently four types of B2B salespeople. Order Takers: Reps who sell simple solutions in simple buying environments. According to Forrester, they’ll see a 37% decline, which translates to 600,000 jobs lost. Explainers: Reps who sell more complex solutions in a relatively simple buying environment. They’ll see a 27% decline, or 400,000 jobs lost. Navigators: Reps who sell fairly simple solutions in complex buying environments. They’ll see a 17% decline, or 150,000 jobs lost. Consultants: Reps who sell complex products in complex buying environments. They’ll see a 10% increase, or 50,000 jobs gained. Will these jobs vanish immediately? Not necessarily. Forrester Research principal analyst Mary Shea, PhD, argues that 62% of salespeople in 2020 will still be Order Takers or Explainers. I agree, as the window of time is too narrow to see substantive swings. However, you will be hard-pressed to find an Order Taker, Explainer, or Navigator that doesn’t want to fight hand over fist for one of the 550,000 Consultant sales roles that are expected to exist by 2020. For those already sitting in the Consultant role, watch out — you have a million people gunning for your job in the next few years. But let’s back up for a minute. Before we get to the future, it’s instructive to examine the past events that led to this state of affairs. Google gave people the ability to find information on their own terms and on their own time. Marketers needed to win back the attention of the consumers flocking to Google (and abandoning more traditional marketing channels), so they turned to digital content marketing. This shift didn’t happen overnight — it was a radical change in the way the world consumed information. 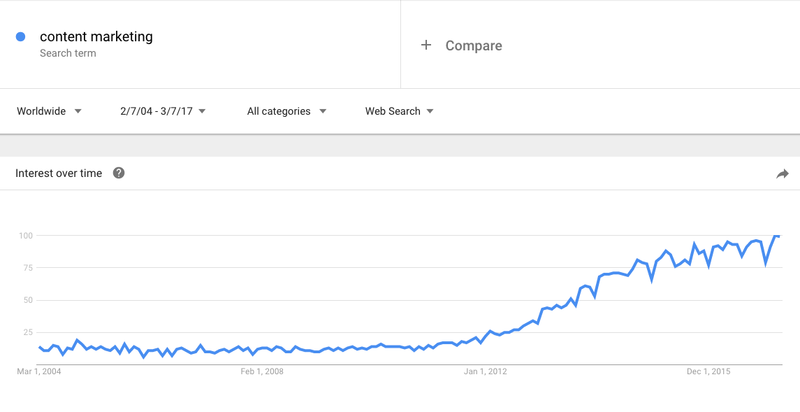 If you look at the trend line for the search term “Content Marketing” from 2004 to 2017, you’ll see it began taking off around 2012. More interesting still, global spend on content marketing fully surpassed $100 billion globally in 2012. It sped up even more between 2012 and 2016, ballooning up to $200 billion. Once search became the primary method people used to answer their questions, businesses had to stay relevant, helpful, and involved by making their websites and blogs their customers’ primary resources — not salespeople. Today, content marketing supplants the need for Order taker, Explainer, and Navigator salespeople, which is why these jobs are on the decline. These jobs aren’t gone quite yet; however, content marketing provides virtually endless access to information to buyers — and simultaneously gives them the ability to ignore any information they want. In other words, most prospects no longer need a sales rep to make a buying decision. Buyers are circumventing reps for as much as 60% of their buying discovery process. In the next few years, they’re predicted to wait until 80% of the decision making process is complete before interacting with Sales. Only 1% of cold calls lead to booked meetings. There are an average of 6.8 decision makers in any B2B sale — more than ever before. Nearly 40% of all buying processes are “blown up” internally before a rep is engaged. 84% of buyers say the sales cycle takes longer than expected. I can’t predict the future, but I can develop a few hypotheses of what will happen from here. In the first scenario, companies develop a breakthrough technology that enables buyers to engage with them in the absence of a human. Some companies are already on, or headed down, this path. They offer chat platforms to businesses to communicate with their website visitors. Most company websites receive hundreds if not thousands of daily visitors — but they don’t have anyone to engage these potential customers in real time. This space already includes large and rapidly growing businesses (for example, Intercom has raised over $100 million from 29 investors). I think these companies can — and likely will — do more. With natural language processing, AI will be capable of understanding questions from website visitors or anticipating what they’re likely looking for and serving them the right piece of information at the right time. AI may even be able to “qualify” a website visitor and take them all the way through a sales process to the point of sale. This model probably won’t work for complex or sensitive enterprise solutions, but it could have an enormous impact for small and medium-size businesses (SMBs). In this future, someone finds an efficient way to help buyers sift through endless piles of information. We’re starting to see solutions like this come to life in the software industry: Sites like TrustRadius, G2Crowd, and Software Advice provide verified customer reviews and feedback for a wide swath of products. Notably, G2Crowd has expanded its service to include reviews for business services too, from translation services and lawyers to marketing agencies. These sites provide buyers with trustworthy, credible perspectives. But resources in this category can’t completely answer the information overload issue because they are contributing to the wealth of content — not helping a buyer cut through it. They also don’t solve for the underlying problem: Buyers don’t always know what they’re looking for or that they’re even solving the right pain point. These sites would provide more value by analyzing a breadth of business metrics and recommending the right solution or solutions. Perhaps a company like Databox or Tableau could partner with companies like TrustRadius and G2Crowd to provide data-driven software and service recommendations. In the final scenario, companies reinvent the role of the sales function, transforming sellers into hybrid consultants who are compensated on new customer success metrics rather than closed-won business. I think this is unlikely to be adopted far and wide in the short to medium-term. In the long-term, it’s possible — but it will only come to fruition after the vast majority of the business world determines there is no longer a sustainable, profitable path to growth using traditional sales methods. We’re not there yet, but there are some companies already experimenting with this model. If you’re one of Forrester’s three “non-Consultant” types of salespeople, you have two choices: Do nothing and ride out the impending transition, or get ahead of this change and learn consultative sales skills. For those interested in the latter, HubSpot offers a free certification on consultative selling. There are also a number of excellent books on this topic; I recommend The Challenger Sale. You should also request your sales manager’s help and feedback as you change your selling strategy. Alternatively, if your clients sell moderately to highly complex products or services, especially in B2B, and you don’t already provide these services, consider adding them to your portfolio. Your best bet is partnering with another consultant or coach who already offers these services or a business with a well-established consultative sales playbook such as Sandler, Corporate Executive Board (now Gartner), or HubSpot. If you’re looking for deep training and hands-on support, you might also consider becoming a HubSpot Sales Partner. This program is designed specifically for businesses like yours interested in expanding into consultative sales services. What’s your opinion? Is the sales profession racing towards the information-overload “cliff,” has it already run over that cliff, or is there no cliff to speak of?